– La Liga Prodota2 y la liga Gigabyte’s Dota Masters comenzó la semana pasada. – No solemos beber ron, pero cuando lo hacemos, disfrutamos de los sabores suaves del Ron Tidebringer del Almirante Kunkka, por supuesto aprobado por Brewmaster. – Los vídeos de las finales del Torneo Starladder ya están “subidos” en internet. – Usted puede encontrar los últimos cambios aquí, no espera: aquí, no! : aquí! La barra principal ha sufrido algunos cambios, las barras de vida y mana se han ampliado (como antes), reorganizando la estructura de la misma. (Clic en la imagen para ampliar). El panel con las estadísticas también ha sido reorganizado, ahora al desplegarse (al señalar con el puntero del mouse) cada estadística y atributos se muestra independientemente con sus iconos correspondientes, dándole un toque de mayor accesibilidad y orden. Se han introducido 2 “emoticonos con voz”, que son “thanks” y “laugh”. Por ejemplo al escribir en el chat, el comando “/thanks” se le escucha al personaje decir “Thanks” obviamente con sonido, y al escribir el comando “/laugh” el héroe suelta una corta carcajada , en ambos casos los avatares animados lambien reflejan su estado de ánimo y se logra ver la vocalización de cada acción. 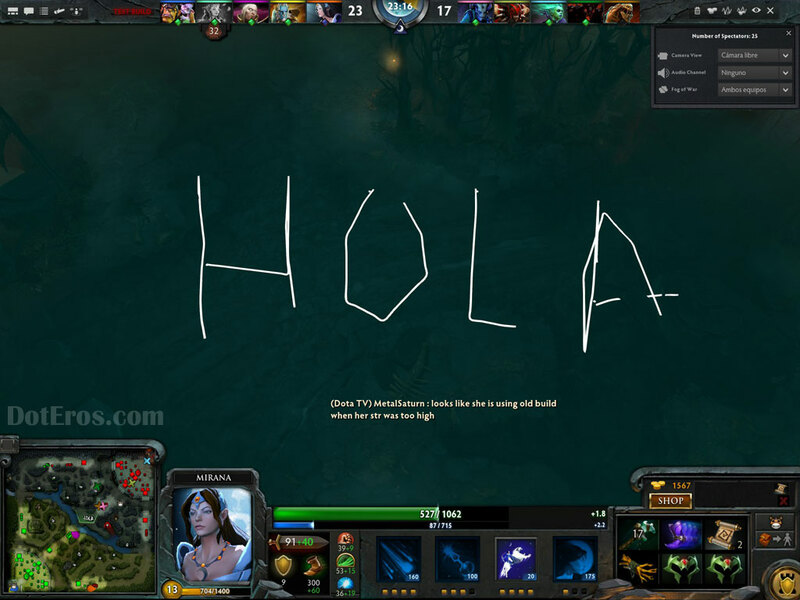 Esperemos que en un futuro nuestros héroes puedan expresarse también en nuestro idioma (Español – Castellano), como VALVe lo ha hecho en muchos de sus otros juegos. Ahora los espectadores tienen la posibilidad de escribir dentro del mapa. (Clic en la imagen para ampliar). 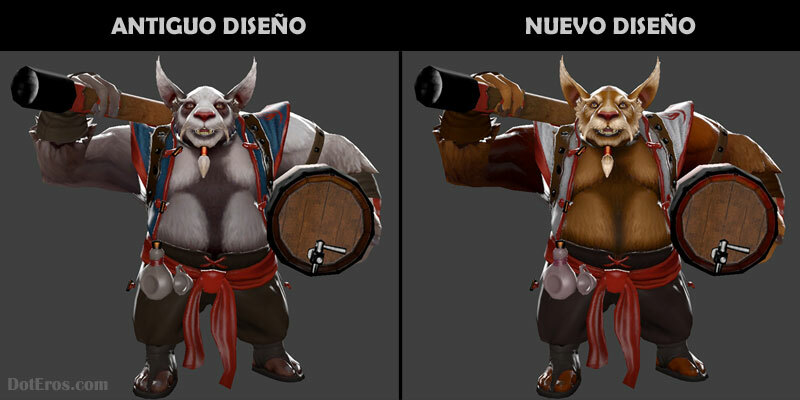 Brewmaster ha sufrido cambios en su diseño, básicamente han habido variantes en los colores y texturas, ¿se deberá a las duras críticas que ha recibido tras su lanzamiento?, muchos DotEros no le “perdonan” a VALVe el cambio drástico que ha sufrido en su adaptación a DOTA 2, no nos sorprendería que vengan más cambios en este PERONAJE que es todo un “Icono” en “DotA 1”. (Clic en la imagen para ampliar). 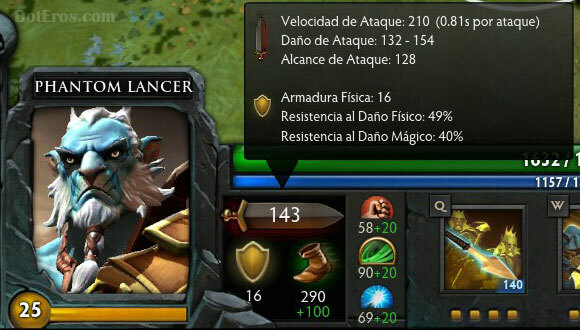 Hablando de iconos, los iconos de los Items también han sido retocados, en su mayoría los retoques han sido “tan ligeros” que pasan casi imperceptibles. – Fixed being able to use ping to identify illusions. – Fixed bug where we wouldn’t always upgrade couriers in order of creation. 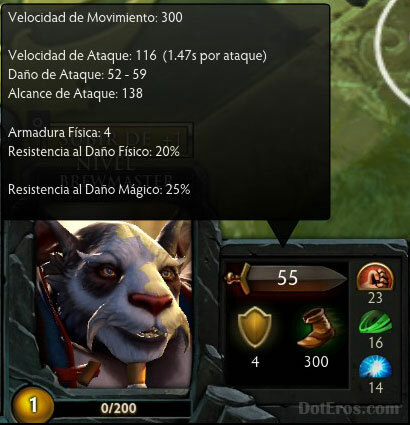 – Fixed potential dispel threshold being calculated after damage reduction rather than before (fixes stuff like Bloodrage not dispeling potions). – Fixed being able to blink if you became rooted after you started casting. – Fixed unit conversion spells (Enchant, Persuasion, etc) not removing existing debuffs properly. – Fixed Searing Arrows not stacking with Eye of Skadi. – Fixed Satyr firing Shockwave onto smoked/invisible heroes. – When the courier returns items to the stash, items owned by the other team are now dropped on the ground. – Fixed Spirit Bear teleporting far away from you with Return (causing it to get stuck in trees sometimes). – Attacking units now follow their target and then resume attack orders after getting disarmed. – Updated attack animation for Spectre, with more impact on the hit frame. – Tranquil Boots regen is now displayed on the HP bar. 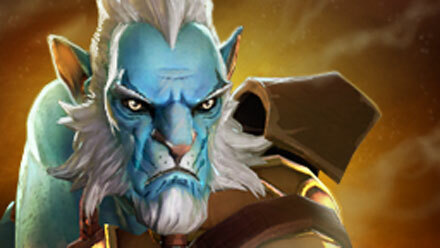 – Clicking “No Courier” opens the shop with the courier item selected. – As spectator, clicking courier button now queries the courier for the current query unit’s team. – Fixed creepstats drawing for all units when spectating. – Fixed missing shared cooldown on the first use of an item. – Extended the health bar above the stats area. – Centered respawn label when showing death panel but not the buyback button. – Fixed a case where the cooldown swipe on buffs was not initialized and rotated backwards continuously. – Selling back a limited stock item within the sellback time restocks the shop. – Broadcasters can now draw lines in the world using Ctrl. – Added two voice emotes. – Bots now use their defense mode desire to determine when to use Glyph, rather than having an independent calculation for it. – Bots will no longer use items or abilities when they are individually disabled. – Bots now switch out of “early game” when either team becomes powerful, rather than just when the opposing team does. This prevents situations where one team is roaming and pushing and the other team is still trying to lane. – Fixed bug that would cause bots to clump at the center of map rather than roaming to gank a target. – Fixed bug that would cause bots to run out of the fountain prematurely sometimes rather than healing up. 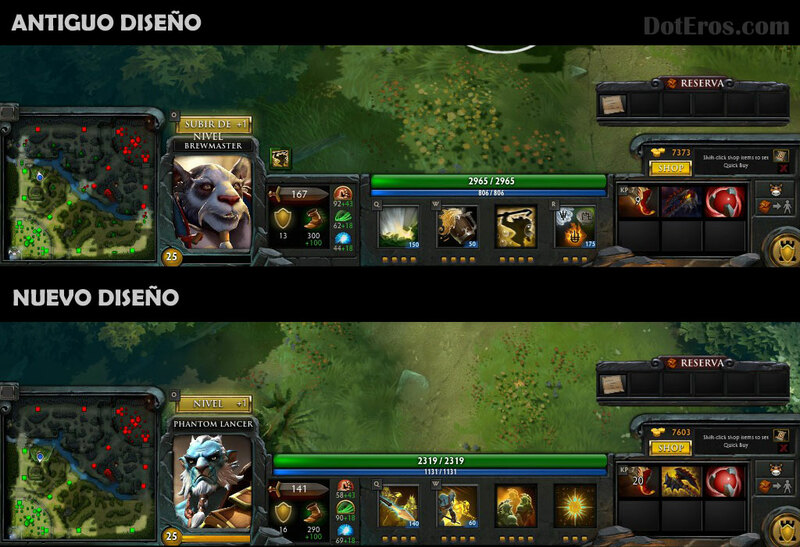 – Fixed bug in lane push desire that would cause bots to underestimate the danger of enemy heroes in the lane. 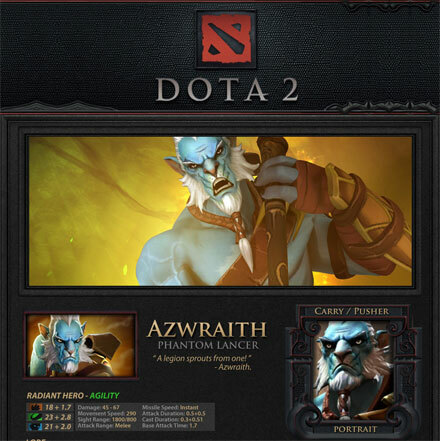 – Bots will now consider both buying their situational (TPs, dust, wards, etc) and non-situational items. – Bots should now only buy TP scrolls when at the home base or side shops, and will want to buy a TP scroll if they don’t have one in their inventory. Una visión general del nuevo héroe por wykrhm. (Clic en la imagen para ampliar).